With the help of a Sunnybrook team that cares for pregnant women with physical disabilities, Kaley Roosen gave birth to her daughter Gwendolyn in 2017. Read more about Kaley Roosen’s story. In 2017 Kaley Roosen added a layer to her identity that for years she thought would evade her: mother. On October 18 she and her husband David Preyde welcomed into the world a healthy baby girl at term, whom they named Gwendolyn. It was a joyous day for the newly minted parents. The birth of Gwendolyn carried deep significance for Roosen, who is a clinical psychologist based in Toronto. As a 12-year-old, Roosen learned she had muscular dystrophy, which comes in many forms and results in the weakening and wasting of the body’s muscles. She had known for years that something was wrong because she struggled to keep up with her peers and running was difficult, but she didn’t know why. She was hopeful a diagnosis meant that a solution existed. Her optimism faded, however, when she was told her physical abilities would only worsen. When she was 16 and became a wheelchair user, Roosen’s diagnosis changed from one of the more common dystrophies that also affects the face to limb-girdle muscular dystrophy. The latter is characterized by excessive breakdown of muscles in the shoulders, upper arms, pelvic area and thighs. Determining the incidence is difficult, because features of the condition vary and cross over with those of other muscle disorders, but it’s estimated that one in 14,500 to one in 123,000 people have limb-girdle muscular dystrophy. Instead of fixating on how her condition would alter her life, Roosen vowed to dedicate her energy to pursuing a fulfilling and lucrative career. In 2017 she successfully obtained her PhD in clinical psychology. Starting a family was not on her to-do list; she didn’t think it was even feasible for many years. She reassessed her life plan, though, when she met other mothers with disabilities after moving to Toronto. Later, when she became pregnant, it was a matter of figuring out how best to manage the health of herself and her future baby. Thanks to Sunnybrook’s care team, led by Roosen’s physician Dr. Anne Berndl, the birth of Gwendolyn was made possible. Roosen, a native of Pembroke, Ont., agrees. “I grew up in a small town. I didn’t know another disabled person, and I never would have imagined a disabled person married [with] kids. I always felt that wasn’t my path.” The old insecurities she felt about becoming a disabled parent were later amplified when she found out she was pregnant. Through her work, Berndl endeavours to dismantle the prejudice she says exists against women with physical disabilities from society and the health care system. She conducts her research via the Accessible Care Pregnancy Clinic at Sunnybrook, which she established in 2017 and has helmed since then. The first of its kind in North America, the clinic manages and cares for women who have disabilities and are pregnant or contemplating pregnancy. One of Berndl’s projects is a breastfeeding study, in which Roosen is participating. Women with physical disabilities who breastfeed their babies are interviewed about how long they breastfeed, when in the day, attitudes they’ve encountered, support they’ve received and techniques they use. The objectives are to address challenges women with physical disabilities face when breastfeeding and equip lactation consultants with evidence-based information, to advise better those women. The study is in the early stages and remains local, but Berndl stresses that the goal is to expand countrywide. “This is part of normalizing and facilitating birth for all women with physical disabilities,” she says. Roosen’s rationale for participating reflects Berndl’s statement. “As a disabled woman, unfortunately, I am used to being overlooked in most research endeavours, particularly around motherhood. I hope [this] study leads to more research in this area, so that other disabled moms don’t feel so much like trailblazers for simply having a child, something women have been doing forever,” Roosen says. 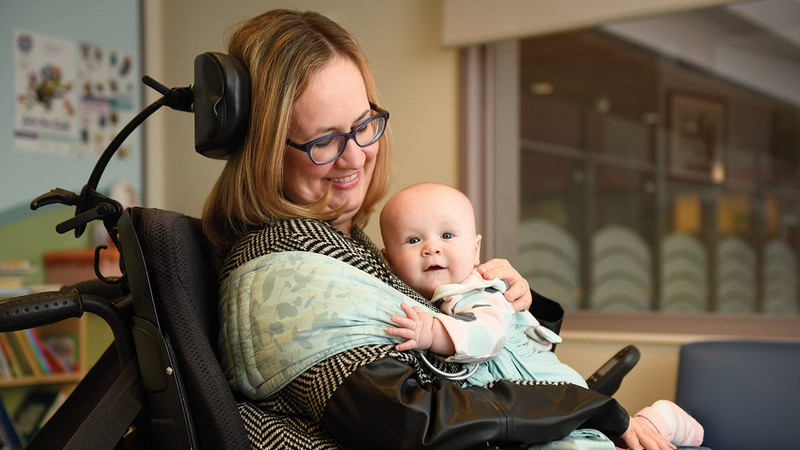 Berndl is working with Dr. Paige Church, an affiliate scientist at SRI and neonatologist at Sunnybrook, to probe the experiences of women with spina bifida. A birth defect that results in the neural tube’s failure to develop properly or close, spina bifida can cause mobility difficulties, challenges in bladder and bowel control, full or partial paralysis, and hydrocephalus (fluid on the brain). In Canada, about 120 babies are born with spina bifida per year. Berndl and Church, who has spina bifida herself, sent online surveys to women with the condition in Ontario and plan to conduct one-on-one interviews. Their aim is to understand better the needs of these women during pregnancy, identify areas in which care providers need improved education and encourage more research in a field peppered with gaps. Two striking findings have emerged out of the 30 surveys returned: most of the women never spoke with their care providers about contraception, and fewer than one-half were told that taking extra folic acid helps to decrease the probability of their offspring developing spina bifida. Dr. Julia Kfouri, a clinical associate at Mount Sinai Hospital, is also involved in the project. Dr. Anne Berndl (right) is shedding light on the experiences of women with disabilities before, during and after pregnancy, with one study focused on breastfeeding. Church isn’t Berndl’s only research partner at Sunnybrook. Dr. Anne McLeod, a hematologist, is another. They are looking at what should be done from a preventive health perspective for pregnant women with physical disabilities who use wheelchairs. Enter thromboprophylaxis [throm-bo-pro-fi-lak-sis], a treatment given to prevent blood clots. Berndl says blood clots are a significant risk for pregnant women, who have a higher chance of developing them in their legs or lungs due to hormonal changes. This potentially life-threatening situation is magnified in pregnant women with physical disabilities. “Having a decrease in mobility increases the chances of getting blood clots,” she says. Compounding the problem is lack of knowledge around when and to which patients to give the treatment. “There’s nothing concrete to guide us, so we’re hoping to develop a set standard by looking at the opinions of hematologists,” Berndl says. The goal is to distribute the survey throughout Ontario and beyond, so that a reasonable standard of care can be generated and evidence-based guidelines can be produced. Berndl is also writing practice guidelines on the management of women with physical disabilities in labour for the Society of Obstetricians and Gynaecologists of Canada. Further, she is researching the pregnancy experiences and outcomes of women with dwarfism, with Little People of Canada, as well as the experiences of women with cerebral palsy and myasthenia gravis—all areas in which research is severely lacking. As for Roosen, she is healthy, happy and with support from the province’s direct funding program, a service that allows her to hire an attendant of her choice to help with child care, loving motherhood. She says she’s comforted by the knowledge that if she chose to get pregnant again, Berndl would be there. Berndl’s research is supported by Sunnybrook and the University of Toronto. Next: Which interventions are best for extremely early preemies?